Futsal has gained a devoted following but has not yet achieved widespread popularity. Developing a passion for the game requires an introduction and opportunity to experience it regularly. Unfortunately, many haven’t had this. The preeminant version of futsal that is played worldwide has been governed by FIFA, and its members, since they developed it in the 1980s. It has been promoted based on its relevance to football with claims such as it helps develop football players or is a more exciting version of the 11-a-side game. They have targeted this at the football community with some success, creating new advocates that further endorsed the game back to that group they were still connected with. The path to developing an interest in futsal coming from football became more ingrained and self-propagating to the extent where it is almost exclusively promoted to those in football. Approaching the football community has been worthwhile and should be continued but such a concentrated focus on the 11-a-side game is limiting futsal reaching its potential for two reasons. Firstly, promoting it through what it offers compared to football creates the perception that it is a substitute or supplement for the 11-a-side game. This encourages a superficial and temporary involvement. To get this to being more genuine and long-term, a group who in football have developed an in-depth knowledge, established their status and are intertwined in that community, need to be convinced it is worth acquiring these things in futsal. This involves significant switching costs in investment of time and effort, even if close links between the sports mean they won’t start completely from scratch. This applies equally to a coach, player or fan. It limits its attractiveness within the football community to only the most open minded who will embrace the challenge, and the less experienced with little to lose such as children. What seems like the intuitive market to target might actually be one of the most challenging to interest. The second reason, and most importantly, is the complete focus on football diverts attention away from both the broader competition futsal faces and improving the game. The rest of this post is dedicated to exploring this second point and how futsal must evolve to reach its potential. Futsal’s competition goes far beyond football and neither is it just other sports, many of which have introduced shorter, more exciting formats to attract new fans and players. Some of these have been so successful they have become more popular than the traditional formats they derived from. Also, futsal is not even the exclusive small sided variant of football in many places. The sporting landscape is challenging enough but the competition futsal faces does not end there. Playing or watching futsal consumes people’s time when they are free to choose what they would like do. This is very limited and there isn’t enough to allocate to all the activities that people enjoy. These include things like watching TV, going to the cinema, visiting friends, working out at the gym, surfing the internet and playing video games. 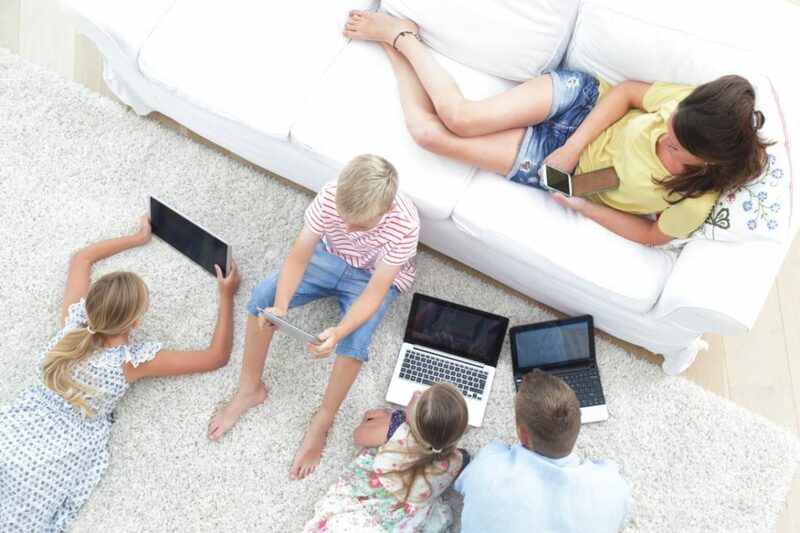 The growing trend in how leisure time is spent has been the increasing part technology plays in people’s lives. 60 years ago the TV became ubiquitous, 20 years later the amount of TV channels available increased significantly and 10 years after that video games gained popularity. A little later most households had a personal computer with internet access that eventually offered online video streaming and social media. Now everyone can do these things anywhere and anytime through smartphones with multiple capabilities. In the coming years, virtual reality, with its immersive and realistic experiences, will become more popular as will e-sports (as recent broadcasting deals suggest) plus many future inventions that can’t be anticipated. Technology already takes several hours of people’s day on average and the speed of technological innovation is increasing. An abundant amount of options and scarce time to do them means high supply and limited demand, creating a very competitive environment for people’s attention. Basing the case of promoting futsal on the benefits compared to football alone, just one of a constantly expanding list of rivals that span multiple industries, makes no sense. Despite the magnitude of the task futsal faces to become a mainstream sport, it can succeed with the right approach. The key to futsal’s success is to switch attention to improving the futsal experience and then positive comparisons to its competitors will be a natural outcome. When choosing what they will do in their free time, people compare, even if implicitly, to evaluate which offers the most rewarding experience. This process is identical to what takes place when a consumer is choosing any product or service. For example, buying a mobile phone involves considering the features to decide which to use their money on. When deciding between whether to play futsal or a video game they will evaluate the enjoyment that will be gained from each and choose which they will use their time for. These situations are comparable with the main difference being the principal scarce resource spent, money or time. To be chosen over rivals, companies are forced to continually refine their product and effectively communicate its benefits. It is survival of the fittest. We can see that technology companies are continually inventing new products and other sports are starting to do the same through creating new formats or updating everything that surrounds the game. Futsal must adopt this same focus of constantly improving the futsal ‘product’ and increasing the awareness of it to gain market share. If your focus is on a competitor rather than your customer experience you can become satisfied, as long as you’re currently ahead, even if your product could be better. This advantage may be temporary as competitors improve or an unanticipated new entrant comes with something superior and you are then forced to play catch up. A customer focus will mean you never stop pushing to provide a more memorable experience. This is one of the fundamental principles that has driven Amazon to quickly become one of the world’s biggest companies. The game does not require a revolution but rather a constant process of evolution. 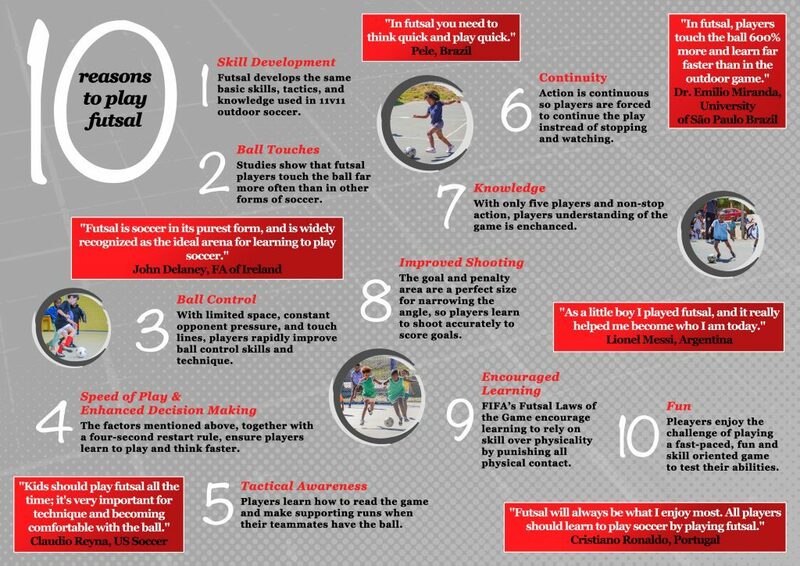 The core premise of futsal as defined by the fundamental rules is what makes it is so incredible and many already have fallen in love with it. Even if there is a case for adapting some peripheral rules to accentuate its spectacular nature such as going back to using throw-ins (see here & here). It is how the game is presented. packaged and experienced in the two distinct segments of the futsal product that needs to be looked at. These are the grassroots game that covers participation and the elite level which is about providing entertainment. Futsal has emulated other sports who, until very recently, barely evolved over the last half century during this period of rapid change in technology and society. Over that time sport became more financially lucrative due to growth in broadcasting deals and sponsorship. This made it complacent when participation numbers began falling. Lamenting about kids spending their time watching TV, then playing video games and, most recently, being on their smartphones could be heard but little was done to address this. Lifetime loyalty is captured during childhood (related to the switching costs built-up as mentioned earlier). As generations brought up on technology over sport grow older that will remain their preference. That could already be bearing out as there are indications that TV viewing figures of sport are starting to decline. This is the curse of success that has been seen time and time again in the commercial world. A famous example is Kodak who, with a highly lucrative business, failed to take advantage as photography became incorporated into phones and eventually went bankrupt. Futsal needs to break away from the historical sport model and embrace innovation to get ahead of the curve. This is where it’s shorter history can be an advantage as it is less inhibited by tradition. Technology poses a threat but it also presents an opportunity to learn from their strategies and product features to enhance the futsal product. Investing billions into innovation and developing strategies to get people to use their products has produced results. They are the leaders in winning the battle for people’s attention as is evident from seeing people all around engrossed in digital devices. Their innovations have become a core part of daily life. Below are a few examples to encourage looking further afield for ideas to help futsal progress and modernise, and provide a better product. -The technology industry, where there are lots of interdependent relationships among suppliers and rivals, use roadmaps to collaborate and co-operate. All the companies involved get together to create an industry wide long-term strategic plan that they all follow. By co-ordinating all their activities, from research and development to final sales, everyone benefits. An example of where this could be used in futsal is when developing elite leagues. From my experience, I have seen a reluctance to work together between those involved and instead isolate themselves. Clubs often see each other as rivals. On the court this is true but off the court it is in everyone’s interest to collaborate. Clubs, federations, venues, TV broadcasters, fans, media and sponsors are all stakeholders in an elite league and need to be part of and contribute to a plan if it is to be successful. Instead of fighting each other for a bigger piece of the pie, working together can make the pie big enough so everyone gets more. – Friction is any inconvenience the customer experiences throughout the whole process of a using a product, starting from finding information on it. Amazon found that a 1 second delay in loading its web pages would cost it $1.6 billion in sales annually and introduced one click ordering to reduce friction in the checkout process. Very small inconveniences can make a big difference in people’s decisions and this applies in both the digital and physical world. To find friction the whole customer experience needs to be considered and how it could be made more convenient. This might be taking payments online, making easier to find out about your products or introducing ways to reduce commute time. – Technology companies have studied human psychology to learn how to increase engagement. Video games are one of the best at maximising motivation through giving users autonomy, the ideal level of challenge and providing rewards on an variable schedule. This can be useful knowledge for coaches and these characteristics are best produced in a game based methodology (See here). – Their pricing strategies are designed to encourage people to give their products a try and get accustomed to using them, something very relevant for futsal with many uninitiated in the game. They use trial periods and freemium models, the latter where they attract people by providing something for free but cover their costs through additional services that are paid for. As well as providing inspiration, the technology industry also offers products and services that can be utilised by futsal organisations. Cloud computing provides online applications for managing teams, memberships, newsletters, sports leagues, customer relationships and invoicing/payments. These are useful tools and you only pay for what you use so there isn’t a big risk in experimenting with them. Online advertising and social media can be very useful for small organisations to promote their products in a cost effective and efficient way. 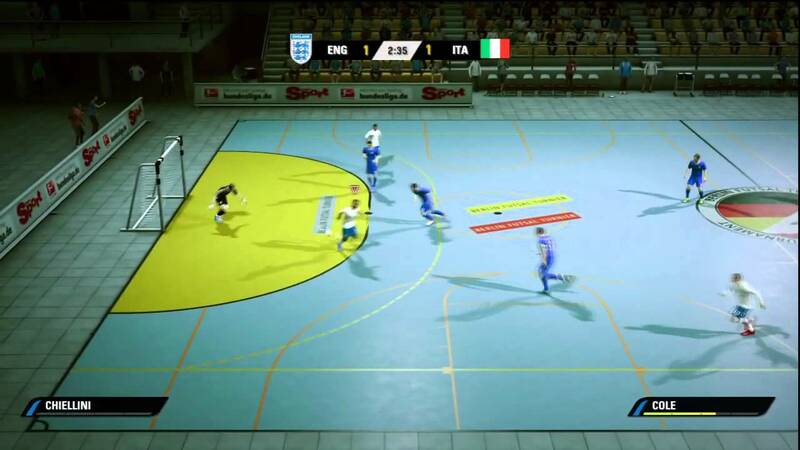 I hope one day there will be a futsal video game to increase the interest and knowledge of the sport and its stars as already happened to an extent when it was included in the FIFA Street video game. EA Sports’ soccer video game has been credited with the increasing popularity of football in the USA. Virtual reality is another way that will enable us to give a taste of futsal with little effort. Innovation requires significant investment as does spreading the game and creating more awareness. This should not be underestminated and can be identified as the key factor holding futsal’s development back as rivals generate huge profits to reinvest in their products. This can only be done through multiple organisations and is beyond the limitations of governing bodies. This is why for-profit companies will have to play an important role in developing the game. Some are uncomfortable with this but below I provide reasons why this is the case. -They can provide much greater amounts of investment. If investors receive a suitable return on their money then this will attract more capital, at levels that can’t be achieved by a non-profit. By a project being profitable there is a big incentive to expand and spread it widely. Hence why for-profit organisations completely outnumber other types. The proportion of money non-profits receive from government is precarious and has been getting smaller in recent times. -The public ultimately decides if for-profit companies stay in business as otherwise they will be allowed to fail like Kodak. This creates an intense focus on satisfying the customer through their products. They are more innovative and can take risky and longer-term projects to succeed. Marketing to promote their products and services is regarded as an investment rather than a cost. Non-profits, on the other hand, have trustees that are required to be very prudent and promote long-term stability. In one sense this is an advantage but encourages investing in more certain projects that have much less potential positive impact. -For-profits are typically governed and structured more efficiently. Investors desire for a return produces an oversight to ensure their money is being managed well and efficiently. This makes them much more flexible and the decision-making process is much faster. Increased accountability can lead to lower expenditure on administration and non-core activities which is another way money leaks out of the game. In contrast, governing bodies have frequently been monopolies with archaic structures, extensive bureaucracy, lethargic decision making and self-regulating. -Loss of funds to the game is not limited to for-profit organisations as profit is the cost of providing investment like interest on a loan and not-for-profits also encounter financing costs. (The English FA spent just under £30 million in 2015 on financing costs). In addition, part of the profits go in state tax which will be used for a wider social benefit. Instead of thinking of the different organisations in terms of having one or other, both can co-exist and are better equipped to fulfil certain roles. Together they can ensure the game reaches more people, innovates and isn’t financially prohibitive. Increasing competition, particularly from advancing technology, has become a major threat but there are other trends that favour futsal. The world’s population are moving to cities, with already over half residing in urban areas where space is at a premium. Football is the world’s number one sport and interest is growing in China, India and the U.S.A. who account for 35% of the world population. This is where we can choose to take advantage of the similarities with football as it helps futsal to be immediately understood. With its characteristics of requiring limited space, being easy to organise and can be played year-round in any climate, it is in a great position to benefit from these two trends. Both futsal and football are great sports that will always maintain a close and mutually beneficial relationship. They are not replacements for each other and you can enjoy both. However, over time, being governed by football federations and their close links has led to too much focus on futsal in relation to football. This is restricting futsal’s progress. Futsal shouldn’t position itself as football’s little brother/sister and be judged on comparisons with its bigger and successful sibling. There is a big world out there that futsal can conquer but that will only happen with confidence to embrace its distinctiveness. Its unique in offering non-stop intensity, dynamism, action, creativity, skill, drama and engagement, all in an accessible way. There will always be a huge demand for this and that has yet to be fully tapped. It can capture a wide audience and has already shown to be popular among groups that other sports have traditionally ignored or not made to feel welcome such as women and families. Success, however, is not guaranteed and there are many challenges to overcome. We must ensure the game is presented and promoted in the best way possible through, above all, a passion for the game but also investment and good management to bring innovation, strategic thinking and increased awareness. Our competitors can be a starting point for learning more about these aspects but the focus must be on futsal and how people experience it. By doing this, instead of opting for the latest gadget, the world will choose to enjoy the incredible sport of futsal.